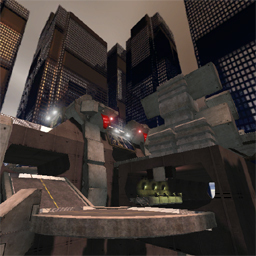 A floating vctf map with three paths, relatively narrow roads, and interesting gameplay. Is it a 'floater' or does it make the cut? The textures are pretty well aligned throughout the map. The textures on the BSP all share the same color pallette of various browns. The variation is mostly left to the meshes to take care of. There are some shiny cube-mapped textures scattered around the map that don�t really make sense with the �junkyard� theme the map tends towards. Many of the meshes are large concrete forms with smaller rusty boxes, scrap metal, and such that make the overall placement seem like a scrap metal yard. The cubemapped textures used for road joints go against the rusty theme by being so chrome-like with nary a scratch on them. They�re well made but probably should not have been used in order to support the theme better. The lighting is both good and bad. There�s a bit of nice shadow work but all the surfaces exposed to the sky � which is a large portion of the map � share the same brightness from the sun. Granted the map is set in a city with an open cloudless sky, I personally often find noon, or near-noon settings lacking in terms ambience potential. The �underground� areas are, in comparison, almost too dark. The shadows weigh far more heavily here and there�s minimal light to brighten it up. It�s a nice contrast to be sure, however, a bit less depth I believe would have worked better. The architecture is fairly nice. The main structures aside from the two flag areas feel simply like large blocks of BSP with some holes cut out of them. 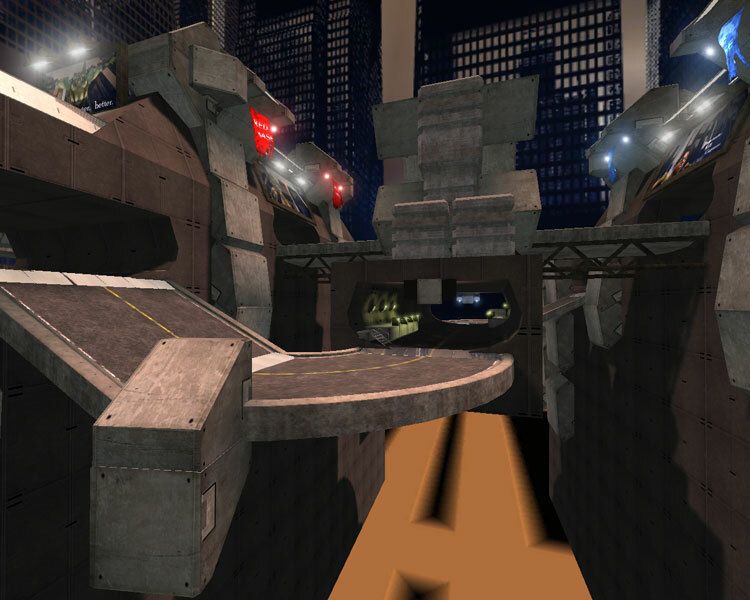 The meshes are really what help bring the architecture together to give it a feel of an industrial scrapyard. The overall effect is pretty nice but some more buts into the BSP would have helped ground the theme in the architecture better. Finally, I personally believe everything in the air should have some sort of support. I understand the challenge in terms of supporting the entire map, but I am displeased by the notion that the two flag base areas are completely unsupported and connected to the rest of the map only by the paths that lead you to them. The skybox deserves a little bit of special attention. The skybox is a simple cube with textures appropriate to the 6 faces of the cube. 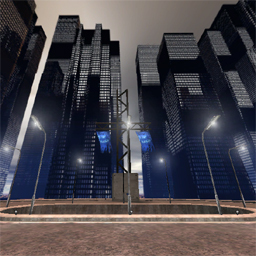 It�s a cityscape with an open sky, tall skyscrapers, and a bottom. Compared to the other 5 textures used, the bottom looks and feels awkward. I�m not quite sure what it�s intended to represent in terms of a city unless it�s supposed to be sunlit roads broken up by shadows cast from the buildings. If this is the case, it doesn�t seem like the shadows are coming from the buildings surrounding the floor. If this is not the case, then I don�t know what it�s meant to represent. Other than this curiousity, when playing the map it�s abundantly clear that the skybox is a cube which detracts from the suspension of reality that it�s supposed to convey. I think it�s a good effort, but it needs a whole lot more to bring the �illusion� of a city home. Overall, the textureing is pretty good, although the color palette could be a little more varied. The lighting is nicely done but with a bit too much contrast between light and dark. Finally the architecture also is nice but some more detail work I think would have brought out the polish more. In general I think it�s �nice� and �good� but it�s a few steps short of being great. The author is obviously competent working with the editor. No HOMs, no awkward joints between BSP, nor between BSP and meshes, there�s nothing that really looks intrinsicly badly done or �broken�. As is the case with most VCTF maps the bots behave a bit wonky. I don�t really play VCTF too much but I�m lead to understand that pathing VCTF maps is tricky yet possible. Perhaps the author should research VCTF pathing a little more extensively when working on his next oeuvre. Other than the pathing, I found the ambient sounds lacking. There�s some general sound but more locational and triggerd sounds would have helped polish up the ambience even more. Clanks and rattles would be a welcome addition to the map. The first problem the map has is the wonky bots as mentioned earlier. If left to themselves, they would do an adequate job. However, when playing with/against them, they always seemed a step behind and were easily distracted by combat opportunities. Again, I would recommend more VCTF pathing research. The next problem is the setting itself. A junkyard suspended in the air by who knows what, you are already dealing with the classic avoiding the edge to survive gameplay ploy which I always feel is fairly cheap and is difficult to really do right. Second, I found that the paths to use in the center areas were just barely wide enough. Except for chokepoints, my opinion is that there should always be room to pass other vehicles with space to spare. I feel that the author carefully calculated this distance and made the main paths exactly that wide. I would have preferred a little more �wiggle room� in the paths. As for the flag bases, I�m not sure if the paths are the same width as in the center but they �felt� smaller and tighter which does add a challenge to capping the flag, but on the other hand there�s almost no structure where defenders can stand that�s not in the road � which makes defending very risky. And this also forces gameplay to the center areas where there�s (slightly) more room to maneuver. Also, the non-central, non-air path is almost a bit too circuitous to be worth trying although the lower area does have a few nice pickups. But it�s quite long and the flag capper will have quite the challege making it all the from one end to another without a lot of help from their teammates. One nice thing the author did was create the spawn areas well away from the flag area. It�s a nice touch and based on the layout it still provides relatively rapid defense times because you can drop down on them as they try to get away. And it�s always a good idea not to spawn on top of the flag anyways. Not that there�s room to do that in this map, anyway. As for FPS, you�ll go from above retail to below throughout the map. When it�s low, it�s not enough to really have that large an impact on gameplay except on very low-end systems so not too bad overall. In general the gameplay is a bit of a mixed bag. 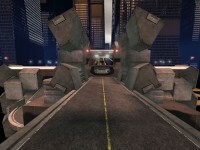 With the narrow driving areas, limiting alternate route, and threat of death from falling, the gameplay leaves a bit to be desired. However, the spawn area positioning and exposure to air vehicles, the gameplay could potentially be fairly good. Too bad the bots don�t think the same thing. 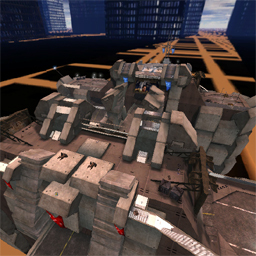 Does VCTF give the illusion of a pretty map with good gameplay but doesn�t meet up with it�s promise? Not quite, but the map seems to be lacking a little bit of polish overall. The visual pallete is a little bland in terms of color and lighting and the skybox is mostly just confusing. 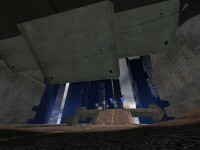 The gameplay also has its plusses and minuses but those players who enjoy the threat of falling should enjoy the map overall. 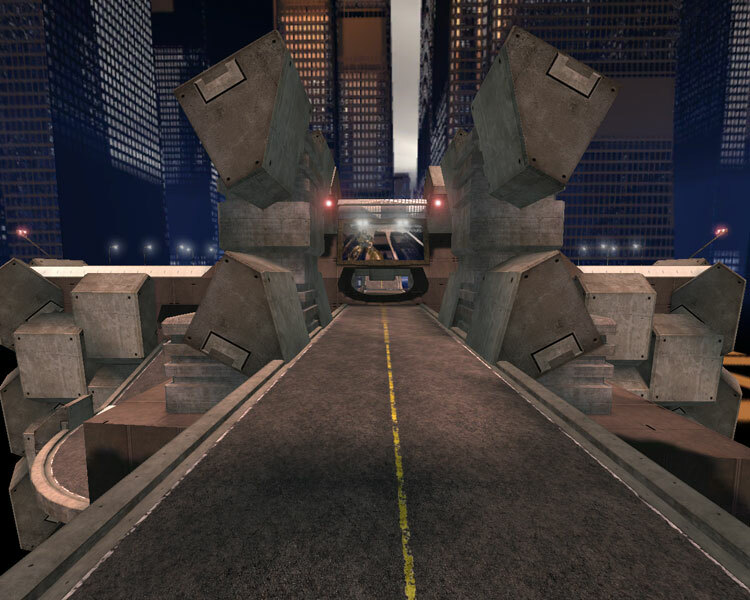 For pure VCTF players, this map might be a bit disappointing but it�s worth a try. The download link doesn't work. Does it acually have bot support? The comment you gave could've implied it. - I predict the straight path will be dominated by Tanks & Paladins when playing online. - Bots can run through the map. Unfortunately, they don't play really well, but the author did all possible to make a good botpath. (The AI for VCTF is terrible & the best way to play this is online). = Why it has no level preview??? But that time with no F***** bot suport.